Runic Rumble v1.0 apk is a Spell Fighter for Android with HD graphics by Epiphany GamesRunic Rumble is set in the rich, unique world-setting of Amorra, and introduces our protagonist, Aki: a mischievous little creature with a sharp mind, and sharper tongue, who has escaped the bonds of servitude to discover the origins of his people. Although short in stature, he is fearless and, as a sort of novice Shaman, able to wield magic – albeit with a novice’s skill. One night, while creeping around an eerie, deserted campsite, looking for food, and maybe the odd trinket to pocket, Aki is accosted by a powerful and mysterious Entity. Enraged by Aki’s trespass, it transports Aki to another dimension where he is forced to fight for the Entities’ entertainment, battling with his spells and wits in order to escape with his life, and learn some powerful new magics, to boot. Game play for Runic Rumble is estimated between 2-3 hours for an average player. This encompasses the 20 featured levels and their various ‘challenge’ modes. Runic Rumble also includes a ‘training mode’ which players can experiment with the spells they have unlocked. The relative simplicity in Runic Rumble allows for easy expansion. Little Stars for Little Wars 2 v1.4.00 apk is a space real-time strategy (RTS) game, where the player has a simple objective: move through the neutral star systems in order to capture all enemy systems. Once you start playing, you will lose yourself in fun levels, ranging from amusing to mind-challenging!The galaxy has plunged into chaos and little wars have broken out along the border - fleet-ships are standing by for you to take control of the battlefield. Form your strategy, conquer enemy systems, and claim victory for your forces! Fast-paced twin stick shoot'em up arcade action with responsive dynamic controls.As the Cube Defender, you'll battle against enemy forces in 3D landscape arenas across five different game modes with three difficulty levels. Invasion - Transport ships are trying to colonize the area - repel the invaders. Downpour - Survive as long as possible against a barrage of gunships raining down from orbit. Gauntlet - Fight your way through tightly packed forces to escape as quick as you can. Countdown - Survive long enough to charge the smart-bomb which will destroy all enemies. King Of The Hill - Only score points for kills made from the top of the hill. Scalable graphics quality and effect settings to support slow and fast devices. Supports Xperia Play touch pad controls. 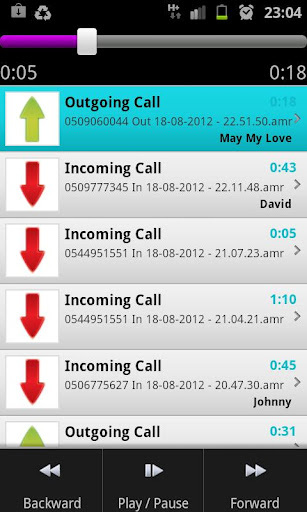 NG Call Recorder v1.0 The only call recorder that will let you record both manual and automatically on-line calls. This great app will manage all your records in one directory by outgoing and incoming calls. 1. Manual recording for single on-line call. 2. Auto recording for constant recording. 3. Changing the format to be used for recording. 4. Changing the recording source. 5. Sending every record automatically to your Email. Volume Boost v1.2.9Unlock Sound Volume limitation present in your device when you use a Headset/Headphone or any other line-out device, and so Significantly Boost Volume Level. Be award that this app may not work with your device if your carrier had modify too much Android. Test it with the trial version first to be sure .